Getting a job is a competition and you need to be equipped with the tools to win that competition. People who win the competition for jobs and career success know something that most people do not know. They know how to make themselves appear to be different and better than their competition. They know how to market themselves. That is often the secret to their success. The Secret to Getting a Job After College will make it easy for you to leverage that very same secret. While you will not have to learn all of the tools that a marketing professional knows how to use, you will need a marketing plan to help you stand out from the competition and get a job. This book will help you create that plan. It will teach you what marketers know are effective strategies in marketing products and services. You will learn how to market the most important product to you and that product is you. Filled with tips and strategies, this book will quickly guide you in marketing yourself and what you have to offer to potential employers. 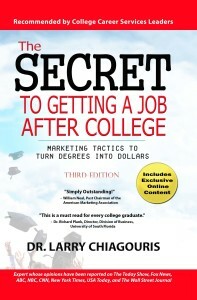 Buy the Book and Gain Access to The Secret to Getting a Job After College. New Music Video Featuring the Book!